Ellie has always been a bit wild, but no one ever expected for her life to end so abruptly when she and her best friend overdose one night. Her older brother Jake struggles with massive amounts of guilt—he knew Ellie was struggling, but distanced himself from his rocky family life when he went off to college. Sarah, the one who survived that night, is lost. She goes through the motions of therapy and sobriety, but all she really wants to do is follow Ellie. And her sister Jessie is guarding secrets about herself and Ellie that she isn't ready to deal with. But when she finds thirty-four pieces of paper under Ellie's bed, all three will have to face the truth. 34 Pieces of You is a complicated, emotional, and mesmerizing account of four intertwined lives and the consequences of a dark childhood and many bad decisions. The book rotates between the perspectives of Jake, Sarah, and Jessie both before and after Ellie's death. Rodrigues carefully pulls back the layers of the characters' lives to get to the heart of so many dizzying emotions, and she makes it look effortless. Jake provides many interesting insights into Ellie's past as her brother, and his own struggles with their fractured family are arresting. Sarah's character and her friendship with Ellie reveals a lot about how Ellie presented herself to the world, kept people from getting too close to her, and how her actions affected her best friends. Jessie was perhaps the only person who caught a glimpse of the real Ellie, but she is so often overlooked. Her secrets are surprising at first, but when she finally confronts all of the difficult emotions she experiences, she is able to start to heal and understand. This story unfolds beautifully and the short, affecting chapters make it an engrossing and unforgettable. Rodrigues is an expressive writer; her ability to convey so much feeling without overwhelming readers with a surplus of words is effective and impressive. 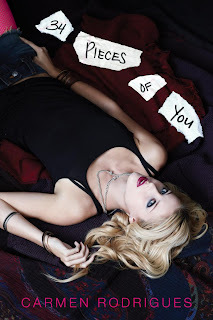 34 Pieces of You is unforgettable and Carmen Rodrigues is incredibly talented. Cover Comments: I like how dark this cover is, and how the girl is looking up. I think everything about it represents the story quite well. This one will be available September 4th, 2012. ARC picked up at Simon & Schuster party. I hadn't heard of this book before but it sounds pretty interesting. I do like rotating narratives and Ellie sounds like an interesting character. I too hadn't heard of this book. While it sounds like you enjoyed it, it seems a little heavy for my tastes. Great review though. This is one of the best books i have read in a while. if you're struggling with depression or suicidal thoughts then i believe you can really relate to this book.